Politics in Uttar Pradesh is considered to be deeply embedded in caste and religion. Any political evaluation of the state is not possible without considering caste combinations. It is equally true that the upper castes had a sway over power, jobs and education system in the state. UP has the most number of upper caste people in the country. They comprise nearly 20% of the total population. Among upper caste, Brahmins are nearly 10% of the total population, which is the maximum among all states. Kshatriya are 7.5%, while Vaishyas and Kayasthas are 3% of the population. They have ruled the state for the maximum period. 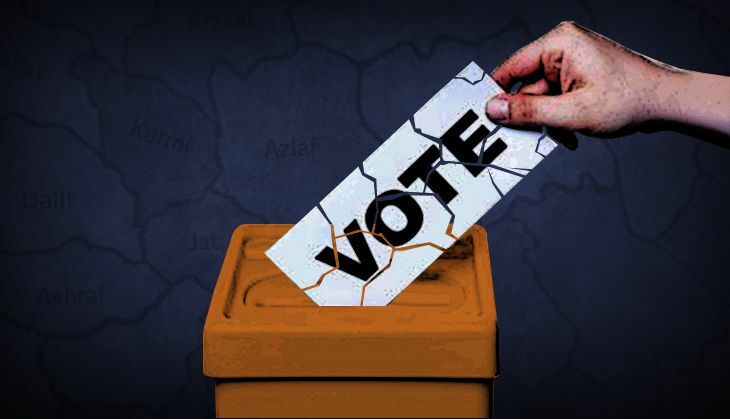 The backward castes are the biggest group in the state with nearly 40% voters, totalling to about eight crore people, including Jats, Yadavs and Kurmis. At 9% of the population, Yadavs are the biggest backward group in UP. They have been aligning with with the Samajwadi Party, reigning from Doaba to the eastern districts. Jats are 7% in UP, but since they are 15% in western Uttar Pradesh, they are a decisive population. They have voted for Ajit Singh's Rashtriya Lokdal or the Bharatiya Janata Party (BJP) as the former is a local leader while the BJP added to the list of backward castes. Kurmis, the third group, comprises 3% of the state's population. They have tried to gain a political identity by taking on the Patel surname. Sonelal Patel tried to consolidate the community's votes with Apna Dal. Now comes the Other Backward Classes (OBC) - Nishads, Kashyaps, Binds, Mallahs, Rajbhars and Kumhars. Eyeing their votes, Mulayam gave the OBC status to 16 such castes in 2005, but the decision was stayed later. Ealrier, Mulayam ensured the release of Phulan Devi, a Mallah, and later gave her a party ticket to contest the Lok Sabha elections. She went to become a parliamentarian. Similarly, Ramachal Rajbhar of BSP, is a leader of the Rajbhar community. The OBCs are nearly 15% of UP's population, but they are scattered, and hence unable to leverage their numbers to their advantage. The third biggest group is that of the Muslims, at 18% of the state's 20 crore population. They have a sizeable presence in both the eastern and western parts of the state and are divided into sub-castes such as Ashraf, Azlaf and Arzaal. The Ashraaf's are upper-class Muslims such as the Shaikhs, the Sayyads, the Pathans, the Mallicks, etc while Azlaafs are the backward classes like the backward Hindus -- the Mochis, the Nats, the Bakkhos, the Mehtars, etc. They are present in Moradabad, Bijnor, Badayun, Shahbad, Bahraich, Kabir Nagar, Sidharthanagar, Meerut, Sharanpur etc. The Peace Party, the Ulema Council, Qaumi Ekta Dal, the Momin Conference and the Parcham Party are active in this belt. The Peace Party actually had a good presence in the areas at one point. In western UP, they are divided between the SP and the BSP. Muslims have a strong presence in 125 constituencies, with 20-25% vote share, in UP. The Dalits have 21.5% vote in the state. Which is nearly 25% of the total population of Bundelkhand. They are 26% in Doab and 22% in the east. Since Mayawati is a Jatav, she gets a majority of their votes. The BJP and the Congress try to bag the Pasi votes, but rarely succeeds.